A type of flour made from dried chickpeas. 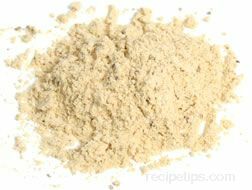 Also known as gram flour, it is a common flour used in India as a thickener as well as for baking doughs, batters, noodles, and other fried or baked foods. For storage, it should be refrigerated in an airtight container in order to keep it for 4 to 6 months.